- Specially formulated coating to be used on exhaust systems to prevent them from rust. 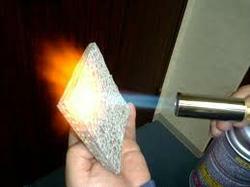 - Excellent Heat Resistant Properties Ranging From 200 Degrees TO 1800 Degrees. - Specially Formulated Silicon Resin For Heat Resistance As Well As Anticorrosive Properties. We have carved a niche amongst the most trusted names in this business, engaged in providing Heat Resistant Coating Service. 1800°C. Thermal Insulation Coating Paint. - We have heat resistant coating which can keep the building cooler. - No other coating over this. - This can be coated over the terrace on the topmost layer of any other treatment. - It can also be coated over the walls. - This saves on electricity bills due to the fact that it reduces the transfer of heat through the slab or wall. Through regular research, we are offering an exclusive collection of Heat Resistance Coating Service to our valuable clients. Apart from this, these services are precisely offered in accordance with the set industry norms as per the requirements of our clients.